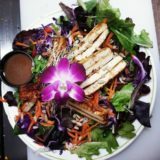 Lexington's only All Vegetarian Restaurant! Serving vegetarian, vegan and gluten free fare with a focus on local and organic ingredients. Available for dine in or take out. Cafe: Monday-Saturday 9am-11am (Breakfast) and 11am-3pm (Lunch) Closed on Sunday. Cafe: Monday-Saturday 9am-11am (Breakfast) and 11am-3pm (Lunch) Grab n' Go on Sunday. Grocery: Monday-Saturday 9am-6pm and Sunday 11am-6pm.